Thank you to all of the participating businesses, supporters, and volunteers who made BBBS Month such a success in 2018! With your help, we were able to raise over $3,000 for local youth in need of Mentorship! Find out everyone that participated and everything that happened below! 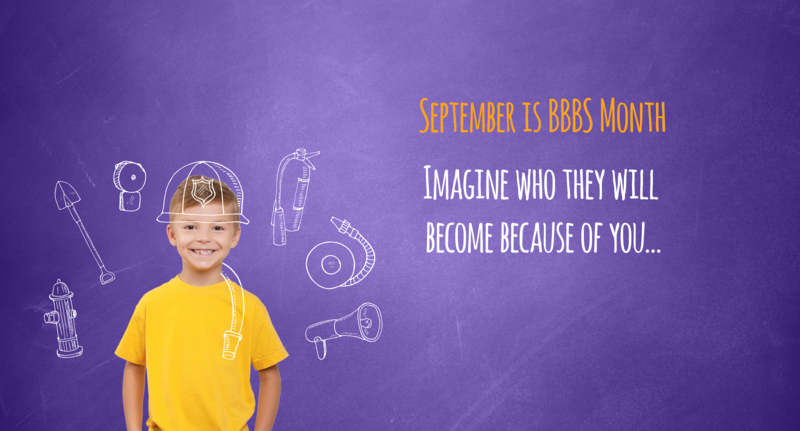 We want to show the impact of Mentoring to the world throughout Big Brothers Big Sisters Month in September and BBBS Day on September 18th, and we hope to leave a lasting impression all year long. This September, #ImagineBBBS and support Big Brothers Big Sisters of Waterloo Region in our effort to teach Kitchener, Waterloo, Cambridge and surrounding townships why Mentorship is so important. Whether you’re ready to spread the word or to move mountains, there are endless opportunities for you to support us on our mission to help every child reach their full potential this September. Getting involved with Big Brothers Big Sisters Month is easy, here’s what’s happening. Businesses throughout Waterloo Region are all chipping in by raising funds at their point-of-sale! Through a donation bin at checkout, donation requests by employees, or donating a percentage of sales, Imagine the impact our community as a whole can have. Will you pitch into the POS campaign this month? If you’re already involved with our organization and aren’t able to make a donation, you can support Big Brothers Big Sisters Month and local youth by helping us shout this out to the world! Posts on your social media account using the hashtag “#ImagineBBBS” and tagging “@BBBSWR”, a small commitment with an incredible impact. The bigger our reach, the more children we are able to help. If you need content or images to posts, we’d love to help you in helping us. There’s no better time to become a Big Brother or Big Sister than during Big Brothers Big Sisters Month! Browse our programs and get involved! We currently have a high need for Game On! and group programming volunteers! Already a Big? Know somebody who would also make an incredible Mentor? We’d love to hear about them! Fill out our Volunteer Referral form! From September 16th to September 22nd $3 from every MVP upgrade purchased at SportsClips will go back to BBBSWR! Your change today could change a life! Find donation bins at participating LCBOs across Waterloo Region! $3 of every ticket purchased will be donated to BBBSWR programs. $1 from every purchase of a Heartbeet juice throughout September will be donated to BBBSWR programs. $1 from every purchase over $25 in September is donated to BBBSWR programs. Nando’s Kitchener is collecting donations for BBBSWR! Head down for some tasty chicken! Donut holes will be available Monday to Friday 7 am to 10 am in the Barristers Lounge and full-sized donuts every Friday! All donut sales will be donated!